Always use wet hands to handle fish, and handle as little as possible. Avoid squeezing it. 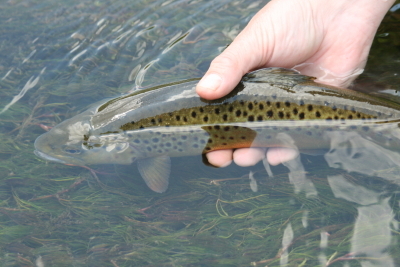 Try to release in the water and avoid landing on the bank or on gravel as this removes the surface slime and leaves the trout vulnerable to fungal infections. 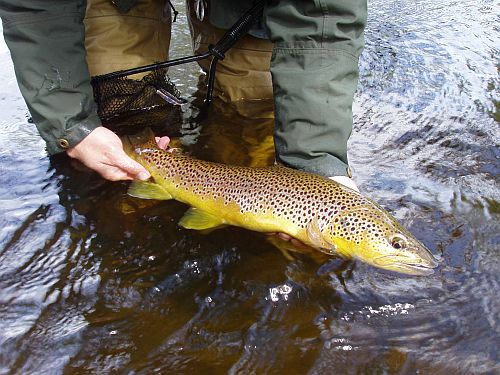 Photograph your fish close to the water, holding it out of the water as briefly as possible. Measure it rather than weigh it. Release the fish by pointing its nose into the current so that water is flowing over its gills. If necessary, move gently back and forth until it swims away (below).